For the third year running the Town Council sponsored Bridgwater History Day held at the Bridgwater Arts Centre was packed out. Chaired by Bridgwater Historian and Town Council Leader, Westover Councillor Brian Smedley, the event boasted 7 other local historians and a range of subjects covering almost 2,000 years. For local resident Anthony Lipmann, this was his first ever ‘Bridgwater History Day’. So we asked him to review it. I did not know – for example – that Sir Richard Percival (1550-1620), of Sydenham, nr Bridgwater, was the man to decipher Spanish plans for an Armada two years before the real thing. As told by speaker Roger Evans, the young but well born Percival had alienated his father by his extravagant spending. He had exiled himself to Spain where he learned enough Spanish to write a Spanish-English dictionary. So, when a Spanish vessel was seized on its way from Holland, papers, instead of being looted as booty were dutifully handed over to the Captain who passed them to the Queen. Percivals translations provided spymaster-in-chief to the Queen, William Cecil, with enough ammo to advertise to the Spanish that England knew of their cunning plans. Sydenham cropped up too in the form of ‘Sydenham Manor’ while on the interesting subject of Pageants and Poltergeists. North East of Bridgwater, this once great seat of the Norman French Percival’s, who came over with William the Conqueror, has, it appears, again fallen into French hands, as it is now lies forlornly fenced in and embalmed on land acquired by EDF. Only rarely open to the public by request, our speaker brought to life its rich past in which a cast of thousands re-enacted our Bridgwater history in their own Bridgwater History Day pageant back in 1927. 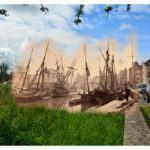 The sepia Victorian and Edwardian photos illustrated maidens balletically acting the waves of the incoming and outgoing tides, local citizens acting out the Peasants Revolt of 1381, Monmouth’s Rebellion and many scenes from Bridgwater’s rich past. The poltergeist story of Sydenham Manor, as told, might act as a warning to EDF managers not to meddle too much with the place and perhaps rather encourage them to re-open this monument to the public. Other talks held us in their spell too, with a talk by Chris Sidaway about his plans for a new ‘Pilgrim’s Way’ from the Motte and Bailey settlement near Dunball meandering through the Polden Hills to Glastonbury. As a collector of facts, I was fascinated too by the story behind the Glass Cone built in 1725 whose base can still be seen opposite the offices of Sedgemoor County Council. As told by Val Bannister, The Duke of Chandos, who had hoped with this plan to compete with the glass works of Bristol and Nailsea with a great Bridgwater rival, lost his fortune in the South Sea enterprise, and thus his hopes were never realised. Converted to a tile and brick works the tower which was the tallest building in Bridgwater was unceremoniously demolished in 1943. 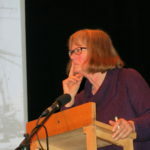 We heard too from Dr Lesley Sutcliffe about Toogoodism. Dr Jonathan Toogood, the early 19th Century surgeon, whose story of humanity and interest in the travails of women in childbirth, led, with his personal investment of £100 (perhaps £1 mln today), to the foundation of Bridgwater’s Infirmary. With its new replacement in 2014 now gracing the outskirts of town, the original infirmary is regarded by some as an early precursor of the NHS. Taking us back to the Dark Ages was Stephen Honey whose insight into Viking Somerset when longboats landed in the Parrett estuary and Alfred the Great liberated England from his fortress in the marshes of Sedgemoor. And bringing us up to the Middle Ages with his investigations into Lyttell Mill and his present day plans to fund raise and restore this Medieval gem situated in the Durleigh Brook alongside the Blake Museum was Stewart Richards, son of 5-times Mayor the ever popular Ken Richards. 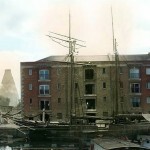 Throughout the day Paul Bovett showed photos of olde Bridgwatere in the bar area, an invaluable living history where people could connect Bridgwater past with Bridgwater present. A medieval lunch of stew and ‘farttes’ (oh yes) (well, 16th century meatballs known as ‘farttes of Portingale’) was provided by Kate Gardner of Purplespoon Catering. Certainly not all in the past was good or architecturally worth preserving but it seems hardly likely that a future history day will be celebrating the temporary accommodation buildings on the Bath Road unless to point out what an exceptionally poor legacy they represent. Our history day certainly told us that heroic attempts to change the world can sometimes succeed.